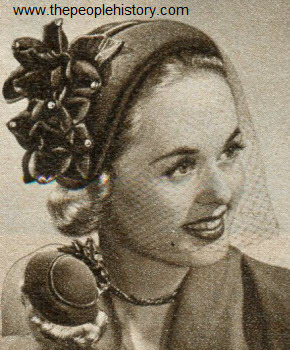 Fashion Accessories From the year 1952 including prices, descriptions and pictures for Ladies and Gentlemens hats, jewelry, scarves etc. 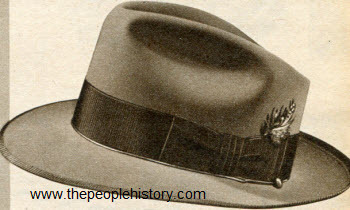 Description A dressy style, has medium width bound brim and wide contrasting band with feather. Genuine roan leather sweatband is comfortable and resists perspiration. Crown is fully lined with luxurious fine quality rayon satin. Protective oil silk tip in crown saves felt from hair oil stains. Form retaining preshaped crown, neat cord and button trim. Colors are medium gray or dark brown. Description Admiral blue, your favorite brushed leather (suede) color. Right for dress or casual wear. Barbour Stormwelt, Goodyear welt. Preflexed leather sole, rubber heel. Description Bracelet sandal; dainty vamp stripping. Has a quarter inch platform and a three inch heel. Composition sole. Colors and styles include brown alligator-grained imitation leather, red alligator-grained imitation leather, green alligator-grained imitation leather or black imitation suede. 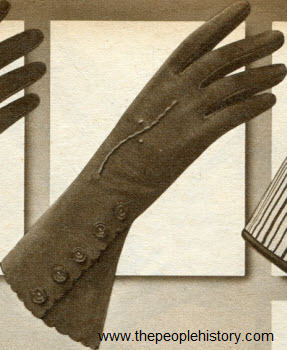 Description On the cuff are novel fashion buds and perky self-applique are lined up in a pretty row. Add fetching scalloped top for an ultra-smart double woven cotton slip-on. Inseam sewn. Comes in black, brown or navy blue. 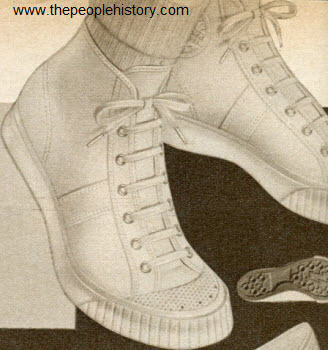 Description The most popular Campus boot. 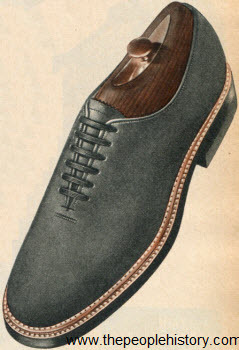 Handsome plump leather upper, expert needlework fore and aft. 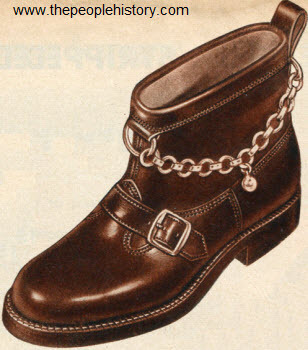 Adjustable buckle and strap. Smooth vamp shines to a rich ember glow. Gold colored chain is removable. Rubber sole and heel. Description The classic frame bag. Convenient front zipper pocket, roomy inside zipper pocket to keep all your "personals" in place. Bracelet handles. In calf-like plastic. Rayon lined. Choose from black or dark brown. Description Dashing convertible cuffs, gay color contrast on double woven cotton slip-on. Turn cuffs down for a two-tone shorty or wear them up for a vented classic. Colors come in black with gold cuff, black with red cuff or brown with beige cuff. 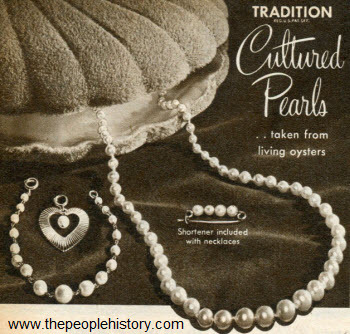 Description Cultured pearl necklace and bracelet. 14K white gold clasps. 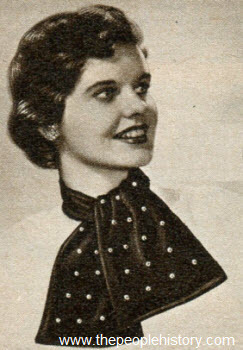 Cultured shortener to adjust pearl necklace to neckline. Description Box of seven briefs in elastic or band leg style. Attractive box contains one pink, two light blue, two white, one black and one yellow, all one size. 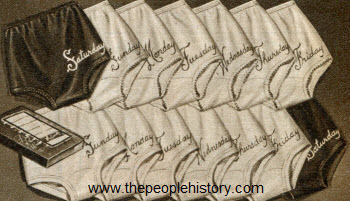 Days of the week are beautifully embroidered in contrasting colors. Runproof acetate tricot is a fine quality, petal-smooth fabric that dries more quickly and shrinks less than knit rayon. Description Dress-up homburg in rich rayon velvet. 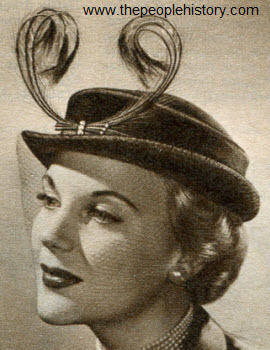 For a new elegant look, swirling, lustrous feathers with blinking rhinestones. Grosgrain band. Rayon veil. Colors are black, dark brown, navy, dark green or wine red. 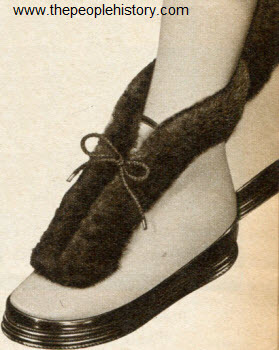 Description Cozy warmth without weight, dressy boots for luncheon dates, the theatre, festive evenings. New soft luster Dynalon fabric, reinforced with rubber. Washable, quick drying, shrink-resistant. Laces snugly in front. Warm deep pile shawl collar. Plaid cotton fleece lined. Fold easily for summer storing. Moth and mildew-resistant. Non-slip soles. Colors are gray Dynalon with brown collar, brown Dynalon with brown collar, or black with gray collar. Description The feathered flatterer. Nothing more glamorous, more chic than beautiful curled feathers, that are hand-pasted on side-dipping helmet for a profile silhouette. In six stunning colors: pink, gold, white, bright red, lilac or black. Description Gray flannel accented with black calf; brown or black suede, calf-trimmed. Round throat pump, two heel heights, leather sole. 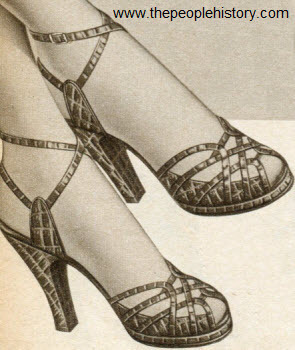 Choose from two and and one-eighth inch heels or two and three-quarter inch heels. Description Nice for school or career girls. Shining alligator-grained imitation leather sling pump, appropriate anywhere. 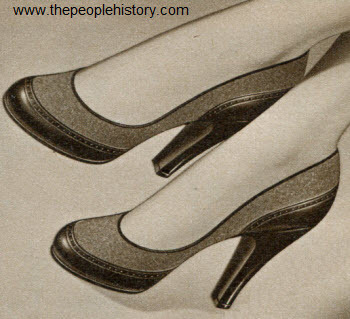 Has a quarter inch platform and two and three-eighths inch heels. Composition sole. Comes in brown, red or green. 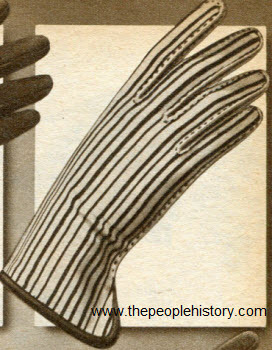 Description Bold stripes mark this double woven handsewn cotton glove the newest look in accessories. Rates fashion raves... it's so perky, so band-box fresh. Colors are white with black stripes, beige with brown stripes, gold with black stripes or gray with black stripes. Description The most revolutionary kind of pad--you yourself control the amount of build-up you wear! Excellent for the girl who wants only a suggestion of additional fullness. Charmode "Inflatables" fit any bra, are made of Latex rubber, yet cost only $1.00 per pair! Tiny valves are self-sealing and won't leak. Set includes two plastic tubes for inflating. The pockets in the bust-cups of the white cotton bra will hold the pads. Combination bust pads and bra cost $1.79. 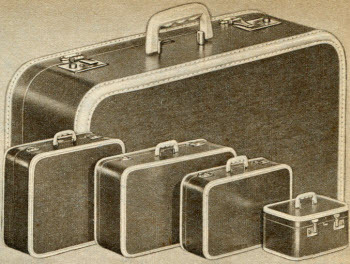 Description Inexpensive J.C. Higgins cases with fashionable appearance of much higher priced luggage. New vinyl impregnated canvas covers look like expensive linen covers. Resist scuffs, scratches, dirt, grease. Clean with damp cloth. Exclusive, white bindings of calf-grained vinyl plastic resist scuffing. Brass-plated steel hardware. Bottom studs, three stop hinges. Plastic handles. Colors are maroon or medium brown. 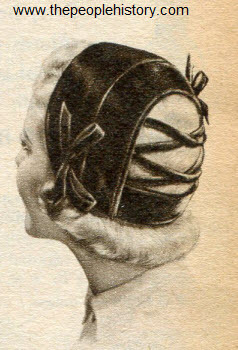 Description The lace-back calot, a pretty show-off that's just the hat for every hair style. Add perky side bows for a demure little flatterer in rayon velvet. Colors include black, dark brown, navy, dark green, or bright red. 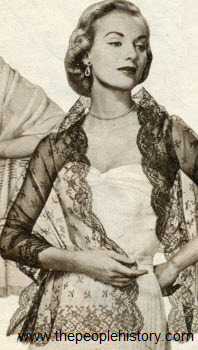 Description Seen when the sun goes down... glamorous silk Chantilly-type lace stole that's filmy sheer. As if by magic, the elegance and beauty of this French import add excitement to your outfit, to the occasion. Fashion extra details... eye-catching scalloped border, fine cotton embroidery. Choose from black or white. 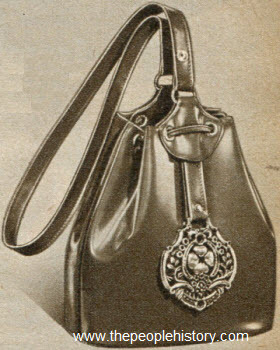 Description The medallion shoulderstrap bag. Big medallion in dazzling gold-color metal, a swinging eye catcher on our new-season version of the important drawstring shoulder-strap bag. It's adjustable. In calf-like plastic. Rayon lined. Choose from black, navy, sun tan, medium red or medium green. 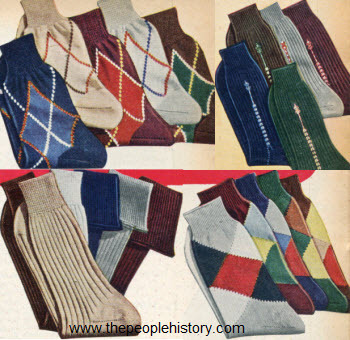 Description Men's socks in a variety of sizes, colors and patterns. Argyle patterns with bold colors and plaids. Ribbed solid color socks and socks with accents. 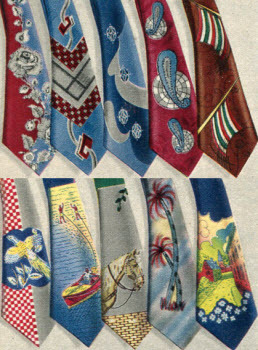 Description A variety of patterned ties for men. Choose from more dressy, work appropriate looks or fun casual scenes. Wool lined for wrinkle resistance and easy tying. New narrow width of three and three-quarter to four inches. Description Ultra sheer, run-resistant mesh. Perfectly proportioned for better fit, longer wear and greater beauty. Proportioned in width and length. Practically invisible stitch reinforced heel, toe and top. Description Bewitching and bedazzling. Brilliant rhinestones circle a peaked fashion extra for an exciting new manipulated profile hat. Rayon veil. Rayon velvet. Colors are black, dark brown, navy, dark green, wine red. Description New peaked throat opera, dramatizes the sweeping lines of a slender foot, a well turned ankle. Imagine it under a tailored fall suit, a wide skirted dancing frock; you'll love it with anything in your wardrobe. Rich black suede, leather sole. Description Queen of shells. 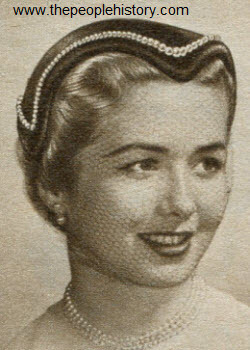 Graduated pearl-like beads define the sweetheart silhouette for a regal hat. Just sits on top of your head, collects compliments. Rayon velvet. Tie-back rayon veil. Comes in black, dark brown, navy blue, dark green or bright red. 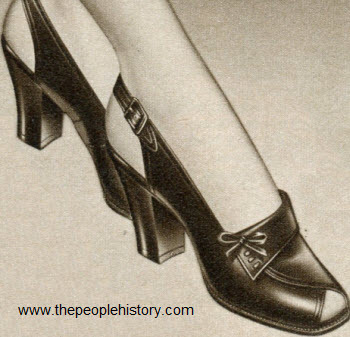 Description A dream of a pump to set your heart dancing, your feet tapping. 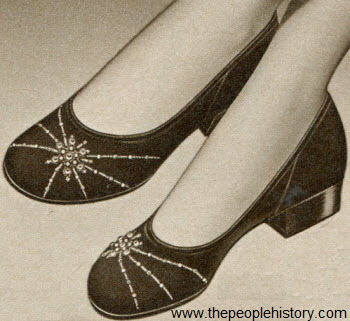 Rich black suede; light, delicate spiderweb and snowflake vamp design, ornament of synthetic pearls, rhinestones. 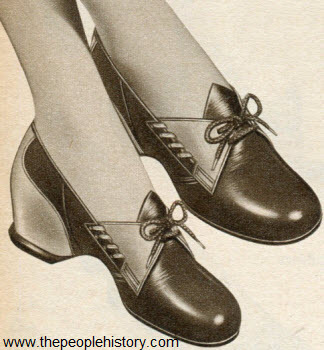 Eggshell throat, three-quarter inch heel, composition sole. Description Fashion says that diamond-bright rhinestones light up your entire wardrobe. Here is a shower of dazzling rhinestone stars on a rich rayon velvet ascot for an accessory high spot that's as gay as Paris. Rayon taffeta lining. Choose from black, red or white. 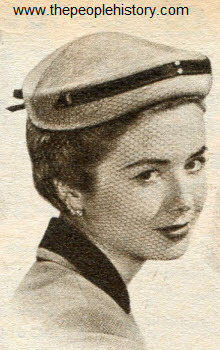 Description "Rosy futured" helmet in wool felt. Rhinestones on twin roses. Rayon velvet band. Rayon veil. Colors are dark brown, black, navy, bright red, or winter white with black. 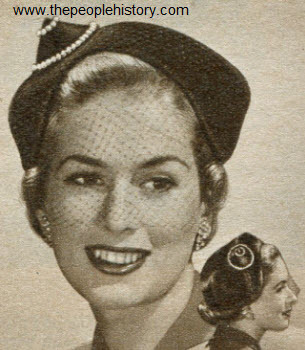 Description Bonnets are more fashionable than ever. Especially in rayon velvet, especially with the bright new jewel touch... twin pearl-like ornaments. Tie-back rayon veil. Colors are dark green, wine red, navy, black or dark brown. Description Follow the curving line for a snappy double flap-over shoulderstrap bag... at home with casual and your more studied outfits. Practical as it is good looking. Open gold-color metal turn lock for a wide, roomy interior. See the center zipper pocket that divides bag into two sections. 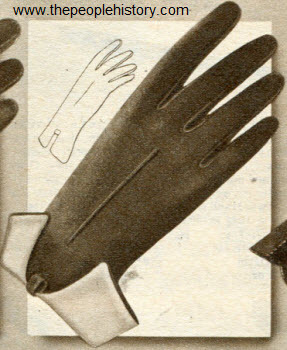 The under flap-over top forms a deep pocket. Adjustable. In smooth calf-like plastic. Rayon lined. 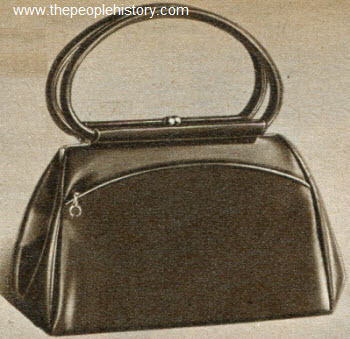 Colors are black, medium red, sun tan, navy blue, or black patent-like. Description Novel two-eyelet tie; you'll be seeing it this season wherever young folks get together. Perforated top line, rounded cord tie. New russet glow with blonde leather, or red leather trimmed in blonde. 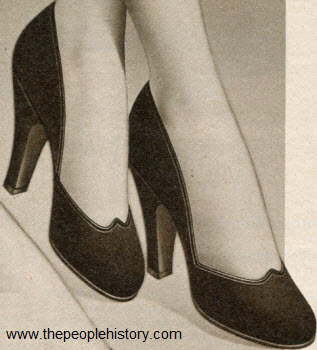 One-inch concealed heel. Composition sole. 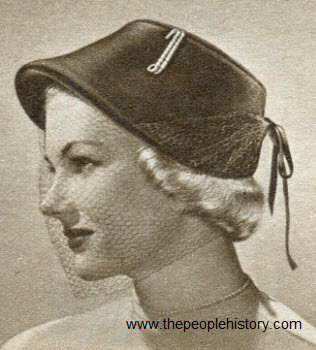 Description What every woman knows... veiling means sure flattery. 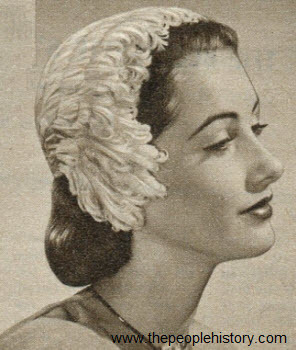 Here twin bows secure filmy nylon veiling with chenille dotted border on rayon velvet bonnet. Colors are black, dark brown, navy blue, dark green or wine red. Description Our finest cushion arch jeeper for women. All three cushion arch features--for springy, shock-absorbing foot comfort. Top grade white duck uppers. White rubber foxing and toe guard. Non-marking molded rubber sole for non-skid traction. Excellent for gym wear. Description Rayon velvet band with a rhinestone twinkle. 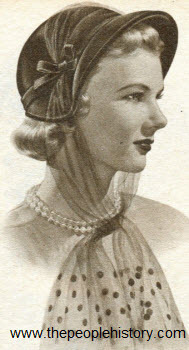 Tie-back rayon veil. Choose from beige with dark brown, black, medium brown, navy, or bright red.